Mega Sale! 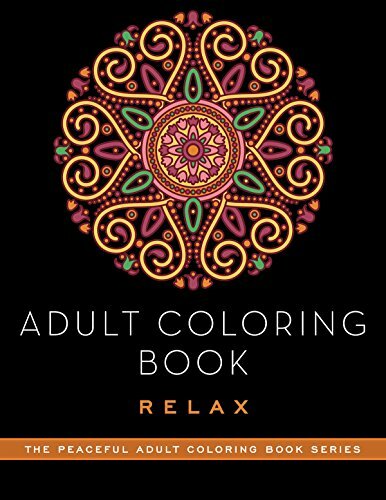 Save 28% on the Adult Coloring Book: Relax (The Peaceful Adult Coloring Book Series) by Skyhorse Publishing at Book Sellers Union. MPN: 151071121X. Hurry! Limited time offer. Offer valid only while supplies last. Everyone needs a little me time” every once in a while. What better way is there to relax and unwind than by coloring these meditative designs? View More In Mandalas & Patterns. Everyone needs a little me time” every once in a while. What better way is there to relax and unwind than by coloring these meditative designs? Elegant abstract patterns and entrancing mandalas await you in these pages. It’s time to de-stress and do something nice for yourselfand your brain. Part of the Peaceful Adult Coloring Book Series, this coloring book is designed with your sanity in mind. Coloring has been proven to be beneficial for adults, creating an escape from the everyday while entertaining your imagination. Your inner artist will be brought to the surface as you visualize the endless possibilities for these enchanting designs. Intricate swirls and captivating patterns adorn pages and pages of mandalas, art nouveauinspired tiles, and other beautiful creations. As you contemplate each design, let your imagination wander over the infinite combinations of colors and approaches. Invest your energies in the tranquility of coloring, and enjoy the serenity that follows. Handpicked for their soothing qualities and intricate details, the designs in this coloring book will transport you to a realm of peaceful relaxation. Whether you’re resting at home or taking a break at work, these pages are sure to provide hours of meditative distraction. Gather your colored pencils, or whatever medium you prefer, and color to your heart’s content.